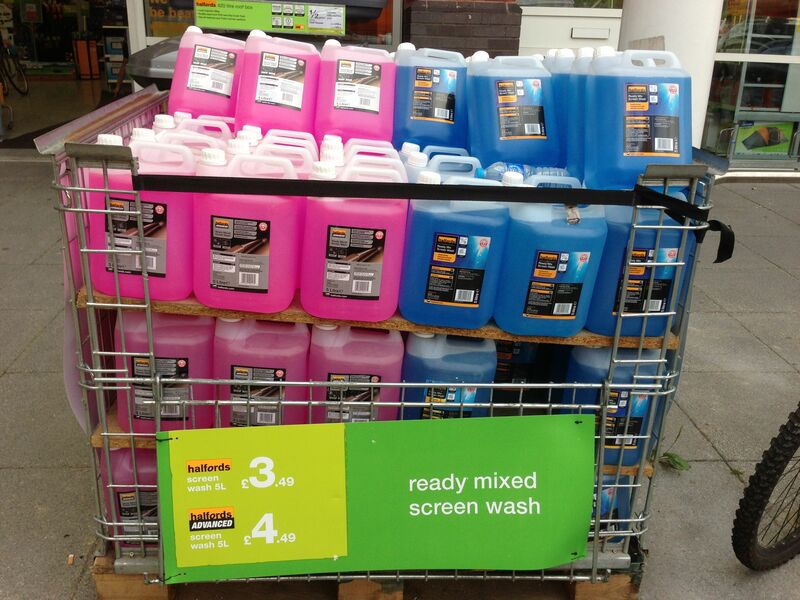 Spotted outside Halfords: two types of screen wash. The blue one is the default (£3.49) and the pink one is the ‘advanced’ version (£4.49). Now, I admit I’m already suspicious of Halfords because of their hideously gender-stereotyped kids’ bikes, so maybe I’m reading too much into this, but… when there are two versions of a product, one pink and one blue, everybody knows that the pink one is for girls and the blue one is for boys. Which would mean that the ‘advanced’ screen wash is being targeted at women. And I’d bet, ooh, at least £4.49 that the two screen washes are basically identical but Halfords are hoping to be able to push women towards the advanced one, because (they assume) women don’t know anything about cars and will be more easily persuaded that they need the ‘better’ stuff. Am I thinking outside the glovebox here? Or just running on empty? This entry was posted in Pink and blue, Uncategorized and tagged cars, cleaning, halfords, pink and blue by janetmck. Bookmark the permalink. FWIW I’ve used both and the pink one and found the pink one “better” as it leaves less streaks on the windscreen (it smells like solvent whereas the blue one smells like soap, so that’s probably something to do with it). Whether the colour is added for marketing didn’t occur to me. I assume the colouring is partly for staff/customers to distinguish easily between the two types, but it seems odd to choose pink and blue as your two colours for a thing where you’re not trying to divide the market along gender lines. Maybe it’s just that they’re seen as ‘opposite colours’ (though not technically complementary colours) so it makes a strong distinction between the two. Is it possible they were going for red-and-blue? I’d think that red would turn out pink because getting deep colours in liquids and having them not be staining is tricky. I think your speculation that pink & blue are seen as opposites is also quite plausible though. I guess it’s possible that it was meant to be red (& interesting point about deep-coloured liquids, hadn’t thought of that) but it is really quite a lurid pink! The two are different formulas, according to their safety information sheets. Crucially, the “advanced” one has additional alcohols methanol and propanol, rather than just ethanol as an active ingredient like the “standard” one. Legally, both must be coloured (and contain denatonium or a similar bitter-tasting substance, and an emetic) in order to discourage “recreational” consumption. Blue and purple are common colours: blue is most-common for screen wash; purple is most-common for methylated spirits; etc. I guess that Halfords were just aiming for whatever colour wasn’t one of those two (so that it stood out as being something different still), but was cheap. I imagine that their options were probably green and pink, and pink “looked better” next to the blue. Mostly speculation, in my comment thus far: but I imagine that this isn’t an example of deliberate gender targetting. Thank you for finding out more about the contents of the different screenwashes! Good point about meths being purple, too. I agree the gender targetting is probably not the most likely explanation, but it is interesting (and unusual) to see blue and pink used in deliberate contrast like that for something not gender-related.